This just might be the oddest piece I’ve written in a while. Does it work? Maybe. Maybe not. Cereal, butter, pasta, chutney, relish…The supermarket list is long. Very long. And it’s my turn to push the trolley, to walk the bright fluorescent aisles, to face shelf after shelf after shelf. It’s my turn to pay the price. 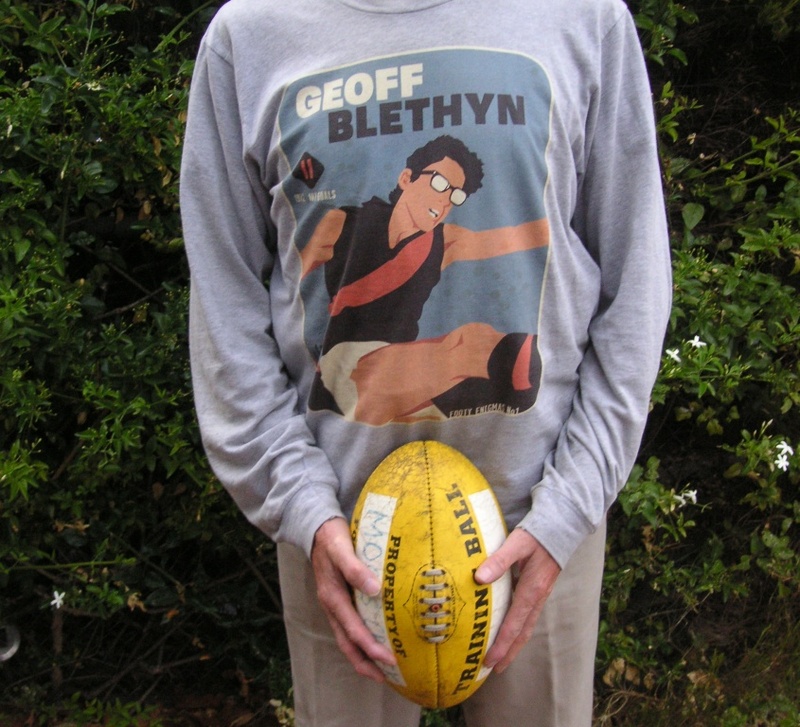 “I’m going to need my Geoff Blethyn T-shirt,” I say, not just to myself, but to the kitchen walls and the loungeroom carpet and the seventeen steps of the staircase. To the car keys, to the shopping list. To the family too, who may or not have heard me as I went and changed. Two plain yoghurts for Julie. Two French vanilla yoghurts for Jesse. Fetta cheese. Haloumi. Brie for Reuben. Four tubs of butter/margarine/yellow bread-spread. Reuben and I turn the first corner, away from the Aisle of Chill. Dips and dry biscuits and more cheeses to the left. Chocolates and other sweets to the right. I’m dazed by the lighting, by the shift in temperature, by the vast array of choice. But Reuben knows the ropes. He knows his way. I stand pushing the trolley, lost in shelves of sweets and savouries. Geoff Blethyn played for Essendon in the late 1960s and early 1970s. He wore black glasses. He kicked lots of goals. At the same time. In 1968, aged just 17, he kicked four goals in the losing Grand Final against Carlton. Half the Bombers’ score. I barracked for Essendon. I wore glasses. I kicked goals – in my dreams mainly, but sometimes in the schoolyard, in the backyard, up at the local oval. I can’t say I’d given Blethyn a great deal of thought these past 40 or so years. But I’d never forgotten him. And then a guy in Hobart called Chris Rees designs a series of T-shirts about ‘1970s footy enigmas’. So, last year, for the first time ever, I make a Father’s Day request. Reuben and I turn into the cereal aisle. I start to relax. I love cereal. Cardboard boxes full of sugar. Cereal and the back pages of the paper – that’s all you need sometimes. Most of the time. Four boxes of multi-grain Vita Brits for all of us. Two boxes of Crunchy Nut Corn Flakes for the boys. Two bags of toasted muesli for me. Two boxes of Sultana Bran Flakes for the heck of it. The trolley’s filling and if it wasn’t for my son’s diligence I’d just keep going til the trolley was overflowing. We turn another corner. Me and Reuben and Geoff. An elderly man approaches, pushing his trolley like he’s pushing a walking frame. There’s nothing at all in his trolley but look a little closer and you might find widowhood and memories and sadness and dreams and hopes and fears and breath. Bread, wraps, taco-shells. Lime juice cordial. Tinned peaches. Reuben keeps the show on the road. The elderly man shuffles down the aisle. Of course, it doesn’t have to be a footy T-shirt that’ll get you through an hour in the supermarket of life. It might be a fragment of a song (even of supermarket muzak). It might be an image from a film, a line from a book. It might be a wave just before it breaks. It might be the smell of rain just before it falls. It might be a kiss, or more. And it might be a footy T-shirt. Pasta, pasta sauce, pesto. Toothpaste, tissues, toilet paper. Frozen peas. But we can’t find relish or chutney (not that I’ve ever known the difference). There’s always something on the shopping list you can’t find. A bottle or a jar or a tin or a tube. A packet of some sort. A cardboard box. A job. An insight. A revelation. A little victory. An answer. A dream that comes true. I guess you could ask one of the staff stacking the shelves. A check-out girl beckons us. Her name tag says Tanya. Her eyes say Hello. Reuben unpacks systematically, grouping the groceries. Is this what it’s going to be like at the Pearly Gates? St Peter, wearing a name tag, and scanning everything in our lives, checking the price we have to pay? And will I have enough on the Visa card? I guess by then there’s no more credit. The elderly gentleman stands at the next checkout. There’s just milk and cereal in his trolley. And, perhaps, grandchildren and a garden and bowls on Saturday. The radio on the kitchen table. Photos of his wife on the mantelpiece. Hand-written love letters in a bedside drawer. Comfort and joy. “Cash out?” asks Tanya. I’m dazed. I still don’t understand this notion of a shop giving you money. It always seemed the other way around. Well, back in the late ‘60s and early ’70s at least. Reuben has re-packed the trolley on the other side of the checkout. Tanya gives me cash. I give thanks – to Tanya, to Reuben, to the elderly gentleman of my imagination, to Chris Rees, to Geoff Blethyn. In November 2018 I met Geoff Blethyn at the old home ground of Essendon, Windy Hill. See Meeting Geoff. Yeah, it works! The response to the footy shirts has been very rewarding, never more so than when I read a story like yours. Thanks Vin. I’m sending the link to Geoff. Thanks Marcus, for reading Shelf Life. Glad you liked it. You’ll find more conventional stories about sport elsewhere on my site. Cheers. Barometers and mood rings of the soul: I get the heroic t-shirt thing. I have a drawfull of fabric-backed rock and roll superstars. I’ll don my Frank Zappa when I need fuzzy, ‘freak out’ energy, or my Neil Young when I’m either introspective or grungy. Wrapping myself in one of my Wilco shirts might call forth warming, melodic memories of one of their concerts. It all depends on what the day demands. You’ve got a Stereo Story happening there…I remember wearing your Juke T-shirt in the second half of our Newport Bowls Club gig, November 2014. What a great story. Goals from impossible angles; almost breathtaking (the elderly man’s trolley). Like Mr Andrew, I have rock t-s but no footy ones. Some are only held together by the plastic image and my shy tribalism.